This February 14th, instead of focusing on the fact that Valentine's Day is a consumerist holiday dreamt up by people trying to sell stuff, why not see it as an opportunity to support indie artisans who work hard to craft green goods in a sustainable way? We've been seeing a trend towards people wanting to purchase lovingly made items from small brands in the USA or from fair trade craftspeople whose handiwork is their livelihood. Check out our roundup of sure-to-please green Valentine's Day gifts that show love for your main squeeze as well as the hardworking folks who make them by hand! If your sweetie loves Scrabble more than they love you (just kidding, but not really), he or she will adore this handmade scrabble pillow set! 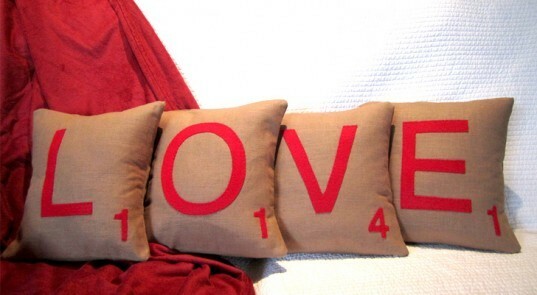 Sewn in Dallas, Texas out of tobacco colored linen with red felt letters, these cushions are a special creation just for Valentine’s Day. “Stumped” about what green Valentine’s Day gift would best please your tree-huggin’ sweetie? 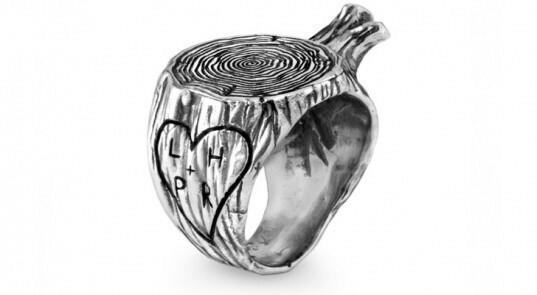 How about this tree stump shaped silver ring that you can even ask designer Aaron Ruff to personalize with you and your lover’s initials? Each one-of-a-kind ring is handmade in Brooklyn, NY. Does your honey cook as good as he (or she) looks? 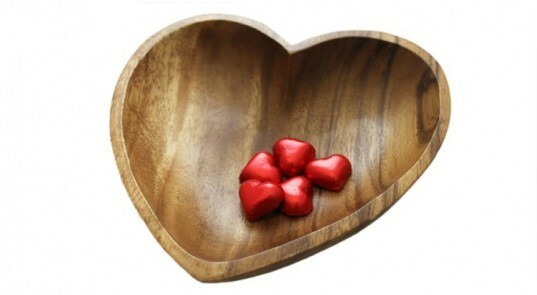 If so, this heart shaped Acacia wood bowl will likely get rave reviews. Hand carved by fair trade artisans in the Philippines, who benefit from product development assistance, access to markets, micro-financing, technical training and special incentives for quality craftsmanship. 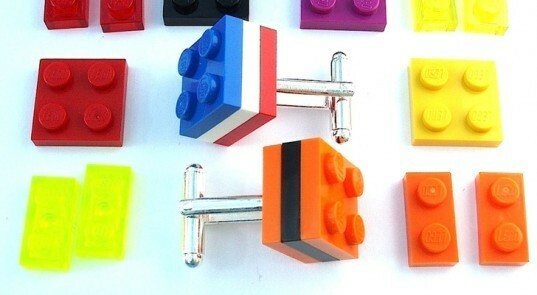 We’d want these awesome Lego cufflinks even if we had no cuffs to wear them on! Made by Ian Bradbury in the Bolton, England, each pair is customizable (you get to pick the colors) and since only the bottom plate is glued to the cufflink, the top 2 layers can be swapped around or even left off completely to create different looks. 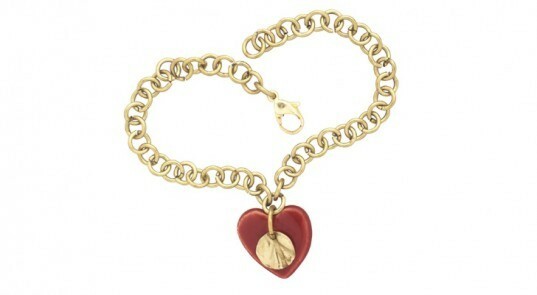 These charming heart bracelets are made by Jacaranda Workshop, a nonprofit organization located in Nairobi, Kenya, that provides employment, training and other assistance to artisans with mental or physical disabilities. At just $18, we think it’s a wonderful alternative to similarly-priced, mass-made jewelry where the profits mostly benefit big companies. 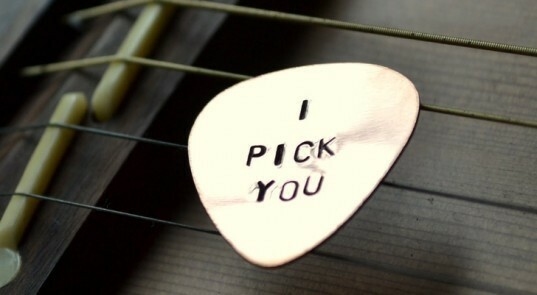 If your muse is a musician, he or she will fall in love with this clever guitar pick engraved with the phrase “I pick you.” Made in Brunswick, Georgia, the picks can also be customized with any other sweet nothing of your choice. Okay, we admit that these heart undies aren’t made by local artisans, but they stand for such a great cause and are so V-Day worthy that we just had to include them. Each pair benefits the Citizen Effect, an initiative driven by the idea that anyone can make a real and significant impact in the world through community projects in Uganda, India, and America. 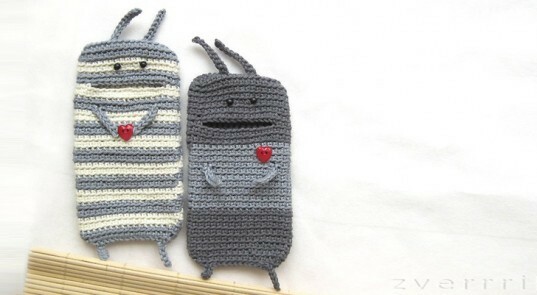 If your sweetie’s smartphone is still unprotected, this cute character cover is a practical gift she’ll swoon for. Handknit by Ann Zverrikki in the Ukraine, each matching pair (yes, one for you and one for your better half) is made to order. All you need to do is give the measurements of each phone. It doesn’t get much more local than your own kitchen. 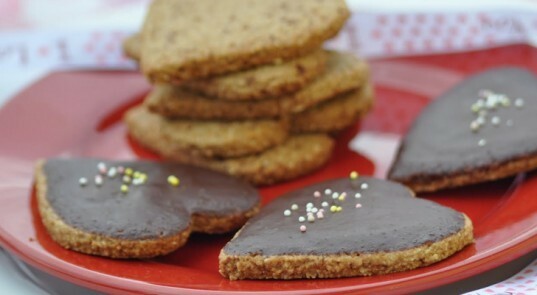 Bake your love a batch of heart-shaped (and heart-healthy) gluten-free, vegan cookies with the assistance of this easy recipe from Nourishing Meals. 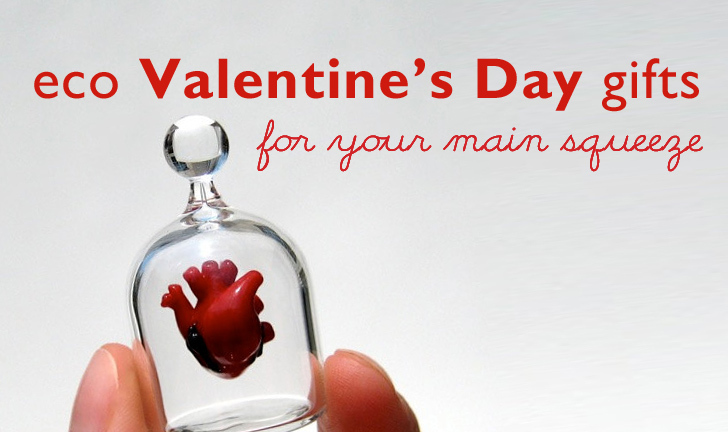 If your Valentine prides herself on being more geeky than girly, give her your heart – literally. Handblown by Kiva Ford in New York, this incredibly detailed tiny anatomical heart appears to “float” in a matching glass jar. There’s a beautiful necklace version here as well. ANATOMICAL HEART IN A JAR If your Valentine prides herself on being more geeky than girly, give her your heart - literally. 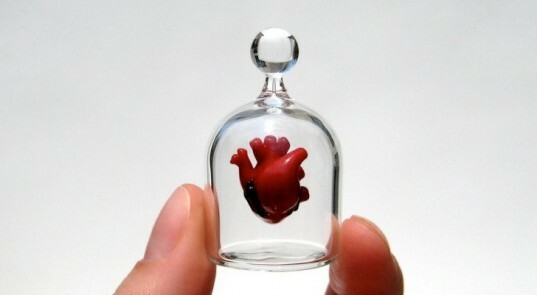 Handblown by Kiva Ford in New York, this incredibly detailed tiny anatomical heart appears to "float" in a matching glass jar.